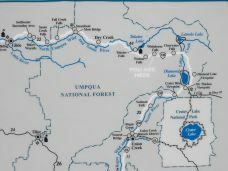 The Umpqua River Waterfalls stretch along highway 138 north and west of Crater Lake National Park and are an easy day trip from Klamath Falls, Oregon. The 4 closest waterfalls are Clearwater Falls, Whitehorse Falls, Watson Falls, and Toketee Falls. Pack a lunch and choose either Clearwater Falls or Whitehorse Falls and listen to the soothing sounds while you eat. Plan on the day trip taking 6 or 7 hours since the first waterfall is approximately an hour and a half drive. Go north on Highway 97, take a left on Highway 138, go past the Northern Entrance to Crater Lake and the Diamond Lake Resort. Proceed approximately 9 miles until you arrive at the first waterfall - Clearwater Falls. Look for the sign and the turnoff is on your left. 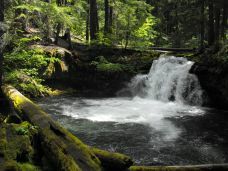 Clearwater Falls is our favorite picnic site of the four Umpqua River waterfalls. Choose your favorite picnic table and each one has a clear view of the waterfall. We advise having a sweater or light jacket because it can be cool in the shade and near the water. Try exploring one of the trails on either side of the waterfall to get a better view (and be sure to take plenty of pictures). Or, hike to the top of the waterfall and see the crystal clear lake that feeds the waterfall. We enjoy sitting at the bench at the base of the waterfall and enjoying its beauty and listening to the falls (that's where this picture was taken). Overnight camping is also available. 2011 UPDATE - Road construction stretches on Hwy 138 between Clearwater Falls and Watson Falls. Be prepared to wait up to 20 minutes at either of the two locations. Also, we didn't find any picnic tables at Clearwater Falls. Travel west on Highway 138 about 4 miles and you will come to the next of the Umpqua River waterfalls - Whitehorse Falls. The waterfall is very close to the parking area. This site is a very good site to enjoy your lunch since there are several picnic tables. Walk onto the wooden walkway to the lookout point and enjoy the picturesque view! The waterfall is 15 feet tall and there is a trail leading to the water. Overnight camping is also available past the parking area. 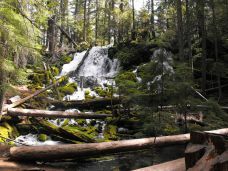 The next waterfall is Watson Falls and is about 6 miles west of Whitehorse Falls. 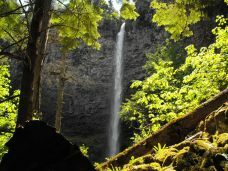 Watson Falls is the highest waterfall in southwest Oregon at 272 feet. There is ample parking just after the turnoff. Even though the trail is rated as difficult there are several benches along the trail to rest and catch your breath. Anyone in good physical condition can easily walk the trail. Stop at the last bench near the base of the waterfall and enjoy the cascading water. Continue walking on the trail and it brings you to a fork - the left trail takes you to the base of the waterfall or follow the right trail as an alternate route back to the parking area. Toketee Falls is the final stop on this day trip of the Umpqua River Waterfalls. 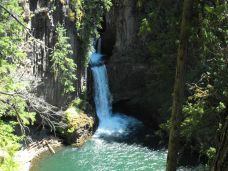 Toketee Falls are less than three miles west of Watson Falls. The trail to the falls reopened in May 2010 and was closed for several years due to damage from heavy snow. It is .4 miles long with several sets of stairs with hand rails. The trail ends at an overlook of the two-tiered falls. Toketee is a Chinook Indian word meaning "graceful". The return trip to Klamath Falls takes about two hours from this waterfall (unless you decide to detour to one of the other spectacular spots on the way home). 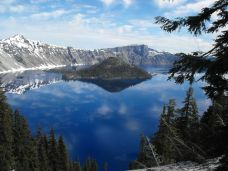 If you have time at the end of your day trip stop off at either Diamond Lake Resort or Crater Lake National Park. Since we have a Crater Lake Park Pass (only $20/year) we like driving through Crater Lake using the north entrance. We always enjoy the spectacular views along the rim. Continue through the park and exit the south entrance onto Highway 62 to return to Klamath Falls, Oregon. Return to Home Page from Umpqua River Waterfalls page.